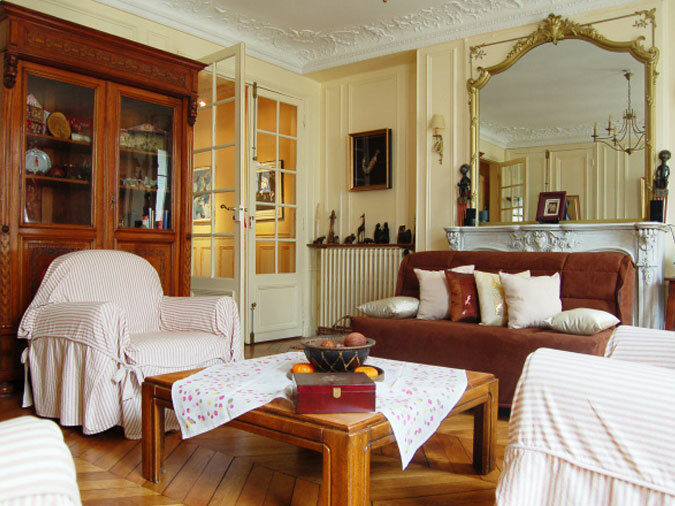 If you are looking to rent that typical french-style an apartment in Paris, here it is. The Roche apartment is loaded with those beautiful French apartment details, from the moulding to the French windows. Perfect for a short stay in Paris! This wonderful 115 sq. apartment, typically French, has 2 bedrooms, a spacious living-room, a nice dining area, an fitted kitchen, a bathroom and separate toilets. The entrance gives onto a spacious corridor. On the left you can reach the kitchen, fully equipped. The dining room is accessible from the corridor. It is really bright and its windows give onto the courtyard. It has a dining table where 6 people can comfortably sit. You will also be able to access one of the bedrooms from the dining room. In the living-room you will find a comfortable double sofabed, a coffee table and armchairs and a beautiful fireplace (only for decoration). The large double-glazed French windows give onto the street.